Disclaimer 1: I am not a statistician. I studied some stats as a psych major, but that was two decades ago. I’m pretty good with math, but don’t ask me to calculate standard deviations or give you exact models of statistical significance here. 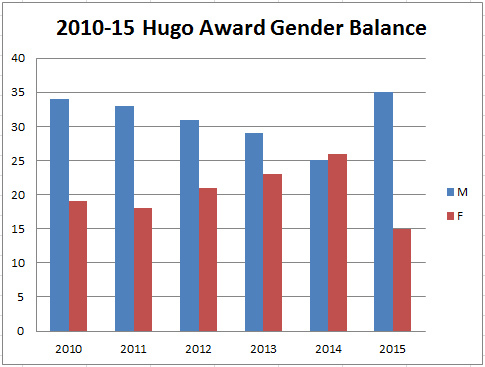 Disclaimer 2: This is a simplified look at the gender breakdown of Hugo Award nominees from 2010 – 2015. I used binary M/F gender for simplicity. I started by looking at the nominees in the four fiction categories: Best Novel, Best Novella, Best Novelette, and Best Short Story. Data comes from the Hugo Awards website. Next, I checked the other categories where a single individual was nominated. (Again, I was going for simplicity here.) Those categories include the Best Editor for Short and Long Forms, Best Professional Artist, Best Fan Artist, Best Fan Writer, and the Campbell Award for Best New Writer. The Campbell is not a Hugo, but as it’s part of the same voting process and ballot, I thought I’d include it. Both the history and the effect of the 2015 puppy campaigns are less clear cut here. While I’m not a statistician, the balance of male and female nominees in 2015 seems to fall within the range of normal variation. It breaks the four-year trend of increasing female representation, but it’s not the drastic imbalance we see in the fiction categories. What can we conclude from this? Not too much. Diversity and representation are intersectional, and can be examined in many different ways. This is just one. What we can say is that, when you put everything together, the puppies have brought us the most male-dominated ballot in the past six years, sharply reversing a trend toward gender equality. I’ve reviewed many of these folks’ books over at Goodreads. If your reading has been rather imbalanced, there’s no time like the present to broaden your horizons. Feel free to leave other suggestions in the comments! Thanks for crunching these numbers, Jim. Sadly, calls to broaden reading horizons tends to fall on deaf ears. Aside from indignantly insisting that they don’t even notice the names on the covers of the books they buy (which begs the questions of whether or not SFF books by women have equally appealing covers and are put out in the places in bookstores where they’re most likely to be found), people can always come up with a lot of circular and non-falsifiable explanations for why male writers get the lion’s share of the attention in the SFF genre, or point to a handful of very successful female fantasy writers, often writing juvenile F, as examples of how sexism isn’t a thing. Oh, I know some people aren’t going to listen to anything I say here. And not everyone is interested in broadening their reading. And we need many more details about the Happy Puppy I see over in the margin. I left out a lot of people, because otherwise this blog post would have been ridiculously long! So many terrific female authors at the top of reading list. In addition to the ones you suggested, props out to Martha Wells and Jude Fisher (Jane Johnson), 2 of my current favorites. Fellow psych major here (both undergrad and grad) who studied a lot of psychometrics (not a ton of the type of stats above), and although I’d love to play with stats all day instead I have some MORE recommendations of my favorite authors. Which is way more fun. I didn’t pick them as my top ones because of gender. They just happen to naturally be my top picks. I’m a huge fan of Diana Gabaldon. And the TV show that follows the Outlander series rocks. I was probably the only one who nominated as many Outlander episodes I could along with the eight book in the seres, Written In My Own Hearts Blood on my Hugo ballot. 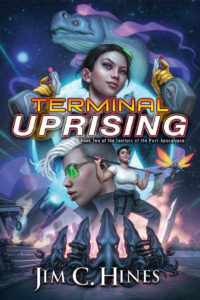 I also really love Patricia Briggs, Nalini Singh (I’m a sucker for her Psy/Changeling series), and Ann Aguirre (Prisons in space are totally awesome!). My tastes tend to lean toward the commercial side of the spectrum I think. Don’t forget Seanan McGuire’s science fiction pen name – Mira Grant. How could you forget Ann Leckie! I just finished Ancillary Sword and it’s every bit as good as Ancillary Justice. I think it’s sad that some don’t think it’s important to broaden the scope of what they read. I can agree that a good story is an important thing, but I took a look at what I was reading and noticed that everything seemed to be written by a white guy. I think it’s kind of sad when readers have to go out of their way to find a good story written by more than one demographic. P.C. Hodgell – I wish she was more prolific, I gobble up any new Kencyr book published. Alma T.C. Boykin – I find her “Elizabeth of…” series oddly interesting. SFnal set on a “lost” planet regressed to a medieval stage and a woman war general! Assuming 20 nominees, there’s a 59% probability a given gender will garner 10 or fewer nominations (or 10 or more, since it’s symmetric). There’s a 41% chance a given gender will garner 9 or fewer nominations. There’s a 25% chance a given gender will garner 8 or fewer nominations. There’s a 13% chance a given gender will garner 7 or fewer nominations. There’s a 6% chance a given gender will garner 6 or fewer nominations. There’s a 2% chance a given gender will garner 5 or fewer nominations. There’s a .6% chance a given gender will garner 4 or fewer nominations. There’s a .1% chance a given gender will garner 3 or fewer nominations. In other words, if you flip a coin 20 times, the likelihood it will land on tails 3 or fewer times is .1%. What is the gender distribution of the population from which nominees are drawn? Anne McCaffery, Mercedes Lackey, Karen Joy Fowler, Kelly Link! Thanks as always for more great author recommendations! I’ve really enjoyed Karen Lord’s novels and I have several of these authors on my Goodreads to-read list, need to add a few more it seems 🙂 I’ve made an effort to read more women/minority authored works this year, I’m sticking to a ratio of 2 women/minority: 1 white dude at least and it’s been great. The variety is just so, so much better and the author voices much more varied and I could go on and on. You have to make an effort at it as most folks read/recommend/etc. white dudes, so if you just go with the flow, you’ll end up with majority white dudes on your reading list because of all the reasons. So make the little extra effort and seek out more variety in your reading, it’s worth it for sure! To be fair, it may also be true that more women than men refused to be on the slate. Women may be more sensitive to the TB connection. I don’t know if that would take us back to statistical norms, but with such low numbers, even the presence of one more woman would make a difference (and we do know of one woman who declined a fiction slot on the slate, though there was at least one man as well). I always wonder… if you don’t care about gender and you’re ‘colorblind’ and can’t tell the difference between people and don’t even look at the name on the cover blah blah blah… why get so offended at the suggestion of reading women/POC/etc? If you don’t care if the author is a man or woman, why get so annoyed about people reading more women? When folks yell, “I only care about good stories!” they are implying that those *other* groups aren’t capable of writing good stories. Pfah. I was thinking that too. I’m sure you could find out more by looking at the original slate, which I’ve seen about the place somewhere. Though two of the women that made the fiction nominations, one of the pro artists and one of the fan writers (at least) weren’t on any slate, and are there despite the Puppies. I don’t know that there’s any way to get a precise and accurate number there. Exactly! They will deny it all over the place, but there is an underlying assumption that reading more women/PoC will mean reading fewer good stories. Just as with the original SP3 justification that all of these “diverse” writers were winning because of affirmative action. They try to deny again and again, but underneath that statement is a very offensive assumption that these aren’t good stories, and any success these people have is not because of their own ability. That is the sort of implicit, hidden racism and sexism that might be a far larger more widespread problem than overt racism and sexism like VD. It is easy to point at the later and call it out as discrimination, but more difficult to point out that the belief someone has relies upon another belief that is offensive, and you can’t just deny believing one while still believing the other without some serious cognitive dissonance. Best Editor for Short and Long Forms, Best Professional Artist, Best Fan Artist, Best Fan Writer, and the Campbell Award for Best New Writer. Now this is the slates as posted, and doesn’t count people Torgersen asked who turned him down, or people who saw they were on the ballot and asked to be taken off before the nominations opened (I’ve seen some notes about that, but we don’t have the full data set). VD of course just copied Torgersen’s list and added more men, and did not, to my knowledge, ask anyone. I think the Rabids are more relevant because they more strongly represented on the final ballot, but that’s another issue. Of the women on the final slate in Jim’s list: 8 were from the slates, and 7 not. This year’s writing nominees are more than 3 standard deviations from the mean. Which got clipped, somehow (copying and pasting error, probably. Of the men on the final slate in Jim’s list: 29 were from the slates, 5 not. This is the best use of statistics that I’ve seen during this whole Hugos kerfuffle. Thanks for the rigorous probability analysis. I notice that no conclusion is drawn here; so, I’m off to your blog for more in depth reading. No, I don’t think it necessarily implies that. If there are enough good stories written by authors of every gender and race, then you’re right: we can limit ourselves to the several dozen good female authors and be fine. But if your standards are picky enough that there’re only a few really good stories, and whatever criteria you use to find them already isn’t turning up many hits, you can justifiably be upset when someone suggests you add on this other criterion totally independent of story quality. It’s not an overt belief that straight-white-male authors produce better stories, but an unquestioned assumption that what they’re doing already finds them the better stories. The racism and sexism might help keep them from seeing the primary problem, but the primary problem is itself one of egotism. Or maybe the dunning kruger effect. I see the SP’s and RPs in the same vein as Gamergate (with whom they were at least somewhat allied): they pretend it is about one thing (diversity in publishing! Ethics in gaming!) when really it is a reaction to growing diversity in their field, and as a result is basically anti-woman, anti-queer, anti-people of color. I’m not saying that Larry C or Brad T are racist, misogynist homophobes, but the movement that they have backed seems to be, at least latently so. And all of their cries of wanting more diversity in sci-fi are given the lie by the facts – most of their slate are white dudes, and several from the same small vanity press. Like many others, i’ve been excited by the Jemisins and Hurleys and Leckies of Sci-fi/fantasy. In none of those online conversations have I seen them pitted as a solution to or answer to white male or military sci-fi. The conversation around this blossoming of diverse voices in the genre has been excitement that the exist, not bashing so-called “conservative” writers. Times are changing. Women are taking a more equal role in the world, including in publishing. America is getting less white. Gays, lesbians, and transgender people are being more vocal in demanding equal writes. We straight white men can either embrace that change and find a way to exist comfortably in a more diverse world, or we can try to fight against it. The problem is, fighting against it is not only fruitless, it makes us into jerks. For Tor submissions it was 32% for women and 68% for men. But… even with that given… the 32% for women and 68% for men is the most accurate data we have access to. Tor is a recognized publishers, and I do not see a reason why one gender would favour Tor beyond the other? I don’t like the Puppys’ slate voting tactics, but it seems odd to me that folks would use statistics to analyse the frequency of Hugo authors. Especially when you take into account the all authors don’t publish every year, and even great authors don’t crank out a Hugo worthy work everytime they publish. Couldn’t there be years where all the best sci-fi was written by women, or by men? The usual initial assumption seems to be that men and women are just as likely to write literature eligible for the Hugo awards. Yet if there is anything certain about our modern world, it is how certain fields and profession do attract more members of specific gender than the other. Thus can anyone deny the possibility that similar preferences could also exist when an authors chooses their preferred genre of literature? To give the exact answer to the above question; we would need to know how many authors there are, what are their genders, and what kind of literature they are writing. Regrettably I am not aware of any individual or organisation that could provide the data. In that article it stated that 32% of submissions to Tor were by women, while the remaining 68% were by men. We could criticise how the above data comes from only one publisher from a specific country. Yet in its defence Tor remains a popular and well established genre publisher. Therefore, I cannot fathom a reason why women would be less willing than men to submit their works to Tor. 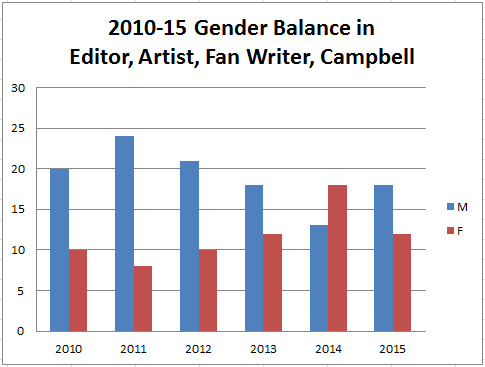 Thus I assume that that the gender division for science fiction and fantasy authors is not considerably far away from the results Tor found in 2013. 32% of authors are women. 68% of authors are men. If we focus on the literature categories of the Hugo awards; novel, novella, novelette, and best short story, we have a total of 20 possible nominations. Thus for 95% of the time we should expect to see 2 to 10 women get nominated in the four mentioned categories. 2015: 3 women, 17 men. Therefore, the years 2012 and 2013 contain statistically significant number of female nominations based on the 95% confidence interval. I think submissions don’t = publication numbers, and one branch of one publisher doesn’t really give you anything like significant data. 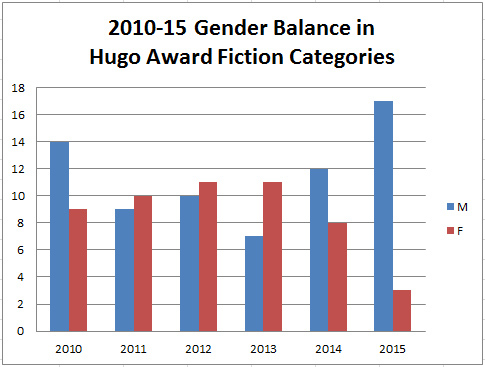 Submissions do not equal publication, but they do indicate how much science fiction is written by different genders. And were we to consider that both men and women are equally talented as authors, and if works are published based on the quality alone, then for both genders roughly the same percentage of submissions should be published. I’m not saying that Larry C or Brad T are racist, misogynist homophobes…. I wouldn’t give them too much benefit of the doubt on that account, though. They’ve said too much in public in each of those bigotry spheres for that. Heck, it only took Brad T a single day to destroy the last of my assumption that he wasn’t really sexist or homophobic. I suppose one could maybe argue that his appalling behavior toward Juliette Wade in the File770 thread wasn’t necessarily sexist. To me, it reads like classic mansplaining, but I suppose one could argue that it was a non-gendered defensive response on Brad’s part to having been made the bad guy by someone else’s account of events. It’s harder to read anything else in his insult to Scalzi (“Not sure he likes women, if you know what I mean”) and his subsequent apology (“sorry I called you gay!”) other than a clear indication that Brad T thinks that being gay is really, really bad. He’s certainly not as sexist and homophobic as Vox Day, but that’s a pretty low bar to aspire to. I don’t know how easy this is to find but the gender ratio of SF WA members should give a fairly good approximation of gender distribution of eligible works. They could well be equal, or not. I really have no idea, nor do you. Plus you’re still only using TOR UK. Also, I may be incorrect or misreading the linked article, but this is only talking about novels, yes? Any idea if it applies to shorter fiction? And I’m not sure we should be even counting horror, as it doesn’t factor into the hugos much, though I suppose the same goes for YA. Also not a statistician here, but you need to compensate those numbers for the availability of works by female authors. Given that in many outlets the great majority of authors is male these numbers absolutely do not support any selection bias on the part of the puppies. So far, these numbers seem to support an existing, and extremely patronizing, mentality of a bias in selecting female authors for awards whilst they still have extreme difficulty getting put on (digital) store shelves in the first place. Do you have a citation for this claim? So far, the puppy party line seems to be to point to a single article about a single publisher (Tor UK) of a single category of fiction. Hi Jim, thanks for answering! Only andecdotal, I’m afraid, which is quite funny I suppose, right after my emphasis on the dangers of statistics ^_^ . It’s just that, a few years ago at least, walking into bookstores, looking at the scifi/fantasy section there always seemed to be a low proportion of female authors. but this is about book reviews, not shelf space. I imagine more reviewed books could get more shelf space (or digitally: a higher ranking, a faster recommendation). On a positive note: the gender balance of submitted books in this report looks much more healthy which makes me question my observation on shelf space. The whole diversity/representation conversation definitely exists on many different levels. Is it a problem because readers choose not to pick up books by women? Because editors favor books by men? Because reviewers are more likely to give space to male-written books? It’s messy and complicated and at times contradictory. But looking at that third chart, seeing the progress we’d made toward gender balance and equality in this particular award/venue over the past five years, and then seeing this year’s numbers…it does feel like a punch in the gut, at least for me. I’ve also noticed that Torgersen has repeatedly referred to previous Hugo winners as ‘affirmative action’ winners, which has its own substantial racist and sexist rhetorical baggage. I am so excited to read “Uprooted”! I’ll have to check out Claudia Grey as well. Katharine Kerr! How did Katharine Kerr and her amazing Deverry Cycle not make your list? Kerr was one of the first authors whose female heroines were strong and flawed and full of agency – the first time I really twigged on that fantasy could be *for me* too! Um no… Larry C is pretty much very sexist, at very least. Mostly because I wasn’t trying to make an all-inclusive list as much as to give a starting point for the conversation, so I stuck with my relatively recent reads. Forgive me, but this progress feels very hollow to me if it is not backed up by a balance in publishing and sales numbers. If there is no change in attitude towards female authors the gender balance in the awards is ultimately just a thin layer of paint, easily scraped away by disturbances as happened recently.